Serious Links for Serious Players! If you're looking for popular sheet music, we recommend Sheet Music Plus. They have the world's largest selection, guaranteed low prices, and great customer service. 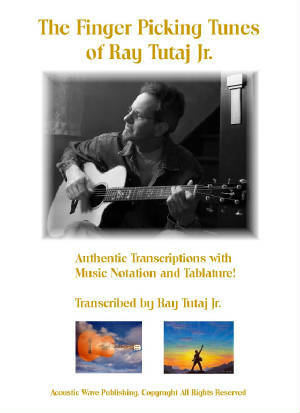 My newest product is a book on CD of 28 original fingerpicking tunes I have created over the years. I am very excited about this and I know each and every tune will help guitar players build up their technique and become better players! On the disc you get all the PDF files plus the wav forms (audio) samples to hear each piece. Many of these tunes I also have on You Tube. Looking for a Guitar Teaching Method? Try Guitar Journey. See a video about the contents of the Disc here. 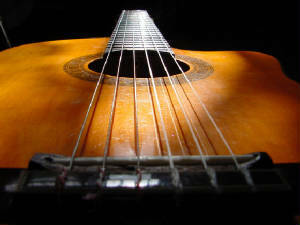 This website is designed for guitar fingerpickers, and provides a wide variety of right hand finger picking patterns. Making you a better player and inspiring you as a songwriter/composer. Learn the technique for making great music. 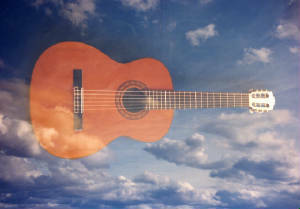 Welcome to a website created for guitarists who are into fingerpicking. There's a whole bunch of patterns to help you take your playing to new heights! Welcome fellow fingerpickers. On this site you can learn how to fingerpick from beginner patterns to very advanced. Within these pages I have many examples from some of the most well-known tunes and pickers. I will show you some of the fingerpicking patterns that can take you to a whole new higher level of playing. Techniques used by many great guitarists such as Chet Atkins, Jerry Reed, Merle Travis, Leo Kottke, Christopher Parkening, Andres Segovia and more. I also will show you how to play some Rock fingerpicking patterns too. Master the right hand guitar technique.